Whenever there is a global summit, no matter whether G7, G8, G20 or G208! two things wind me up about all the razzmatazz. Firstly, the headlines stating great achievements have occurred and then, with monotonous regularity we learn there are problems. The second really presses ALL my buttons when the leaders get together for the obligatory group photo op. The first thing I do is carry out my standard ‘character assessment’, by looking at each face and asking the same question: “Would I buy a second hand car from this person?” The answer is always a resounding . . . Don’t even have to finish this sentence, do I?! Why the pictures . . . New agreements, Global unity? Oh give me a break! And the cost of these ‘bun fights’? If people knew the vast amounts of their money involved to achieve an unbroken record of failed agreements – to quote Henry Ford: “There would be rioting in the streets”. If we turn now to the World Economic Forum and their annual meeting, held each year at the end of January in Davos in Switzerland, we find a completely different can of worms. Here attendees are primarily made up of the 1%. Secrecy abounds on who is there and what the full agenda includes, with no official photo ops, like the ‘G’ Summits. OK, we have the staged publicity, of which last week’s theme was all to do with climate change and how desperate the situation is now becoming. Al Gore was there to berate everyone for turning up in their private jets. (Can’t really see Rupert Murdoch getting the train, can you!) The whole publicity stunt seemed to me to be hypocrisy verging on the farcical, given that most of the attendees are bosses of the global corporations that have created the problem in the first place! When I first heard about TPP, what staggered me was not its scope for democratic abuse, although that was bad enough but that it had been on government agendas for 10 years before being ‘whistleblown’ into the public domain! How could this be I kept asking myself, until the penny dropped. WEF is the perfect environment in which something as radical as this could be conceived and developed on such a global basis and in such secrecy. 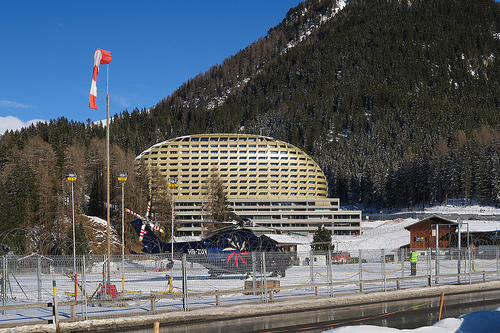 Meetings in secure conference rooms in a remote place like Davos present little problem for the CEO’s and politicians who need to get together and devise and implement these strategies. Lost amongst the 2500 attendees and public fanfare of ‘climate change’, meetings such as this are happening all the time and achieving more corporate goals than the supposed main theme of the forum . . . and certainly more than any ‘G’ Summit ever has! Secrecy is the stock in trade of these global institutions. If we look at the IMF, we have its public face in Christine Lagarde, a very intelligent and erudite lady with beauty and charisma. She is just as comfortable speaking at a financial conference as she is appearing on the pages of fashion magazines. Perfect in the high profile position she holds and a necessity, I would suggest, given current IMF imposed ‘austerity’ measures and their crippling effect upon the people of Greece, Spain, Portugal and others . . . But who are her bosses? Can you name the head of the World Bank? No, neither could I without looking him up, until a piece in the Guardian showed a photo of Jim Yong Kim. I’m sure he is equally charming but given his power, what do we know about him? Nowhere near as much as we know about former Italian Prime Minister Berlusconi and the other ‘G’ Summit attendees. Little by little the internet is helping us to lift the veil upon the real power on the Planet. As we become more knowledgeable so we can understand what we are up against and how to respond. It will bond us as never before, because bonding is the only result ever to come from injustice and abuse. Edward Snowden showed us that, as well as the Greek people last weekend. Social media has taken us global and the momentum of the lifting veil is building. “Power remains strong when in the dark; exposed to the sunlight it begins to evaporate”. 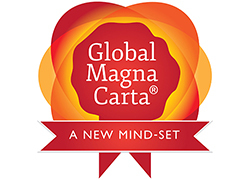 This entry was posted in Global Magna Carta, Transparent Democracy and tagged 1%, Corporations, Davos, Secrecy, TTIP, Voter Power on January 29, 2015 by John Coombes. Whilst I am not a supporter of any extreme beliefs, be they religious, political, financial or corporate, I think it took this type of thinking to begin a reaction to the abuses the Greek people have been enduring for the past 5 years. Even just a superficial understanding of finance shows that ‘Austerity’ is not a solution to their problems but merely a means by which the troika could support the plunder and control of Society. What I find repugnant is the origins to the problem and the subsequent abuse which simply added insult to injury. In the beginning it was irresponsible politicians who sought to stay in power by borrowing more money. They were supported with even greater irresponsibility by Goldman Sachs who, we are told, used some ‘creative accounting’ to ensure the new funds, on which they earned obscene fees, were hidden from the gaze of the Greek people and EU application forms! The actions of both parties was premeditated abuse, as they were all fully aware of the consequences of this joint irresponsibility upon the people. It mirrored the same consequences that irresponsible lending achieved with the US sub-prime mortgage fiasco, resulting in the same pain and misery. Whilst the troika were quick to impose severe penalties on the Greek people, no such penalties were imposed upon Goldman Sachs for irresponsible lending. More irresponsibility? . . . You decide! The sinister human cost of ‘Austerity’ can be measured by the escalation in levels of suicide, the degradation of people who previously held responsible jobs and now search the garbage for sustenance and the country’s youth, half of whom see no chance of getting a job in their lifetime. Let’s just stay with that last point. Can you remember your youth and the knowing that all you had to decide was which type of job or career you wanted to pursue. How would you have felt after 5 years of despair of ever finding ANY employment and then hearing the MD of the IMF telling you it would be something you might have to get used to! If ever there is a breeding ground for young terrorists it has to be here. Watching ISIS and the others striking blows against the Capitalist system must look increasingly more attractive as your time without a job, or any purpose to your life just continues seemingly endlessly, fuelling a growing anger. People are not stupid and particularly not the young. As a species we are designed to reach a point where the powerful forces within each of us push us to find a mate, build a home and bring up a family. The greed of the political and corporate world has overlooked this fundamental aspect of what we are all about, resulting in frustration, resentment and anger building up like a global pressure cooker, until a backlash occurs. Believe you me it will be no damp squib when it comes, because we are abusing primal forces here and the energy this generates will do whatever is necessary to return balance to all that is so much out of balance now on this beautiful Planet. The reactions of the Greek people, after Sunday’s election results, endorse the desperate need to end the abusive slavery of ‘Austerity’. People are not sure how Alexis Tsipras and his Syriza party will improve matters but the very fact that he is prepared to defiantly stand up to abusive methods that are not yielding any results after 5 years has touched a nerve, not only in Greece but elsewhere. 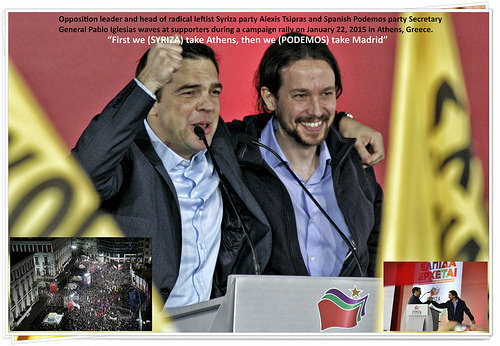 In Spain the Podemos Party Secretary General, Pablo Iglesias, is now suggesting Syriza’s victory could be repeated there, as levels of discontent at ‘Austerity’ also continue to grow. Given similar climates in Portugal and Italy, will we see a groundswell from the political backlash in Greece, as other old political orders, seen as condoning and supporting the abuse, come under attack? Possibly but what I do sense very strongly is that we are reaching a global tipping point. Like every bad general, those in power are spending all their time concentrating upon winning every battle, not aware that they are losing the war. Surveillance and debt to suppress, QE to keep a bankrupt financial system afloat and secret trade deals to support unlimited profit growth and castrate democracy will all eventually implode from their own abuses. In the meantime, whatever it takes to ignite and unite people globally will bring matters to a head and Mr Tsipras and Syriza could well be that spark. This time however, unlike the Occupy ‘movement’ who fought valiantly outside the corridors of power, we have a political party with defined leadership fighting within those same corridors . . . Interesting! This entry was posted in A Complete Overhaul of Money Supply, A Secure Social Infrastructure, From ‘Profitable’ to ‘Charitable’, Global Magna Carta, Respect for the Young, Towards a Global Village, Transparent Democracy and tagged Abuse, Democracy, Elections, Empowerment, Greek Elections 2015, Voter Power on January 27, 2015 by John Coombes.